The Aspen Institute is an educational and policy studies organization based in Washington, DC. 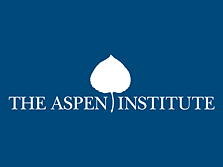 Often called a “tank of thinkers”, the mission of the Aspen Institute is to foster leadership based on enduring values and to provide a nonpartisan venue for dealing with critical issues through seminars, young-leader fellowships around the globe, policy programs, and public conferences and events to provide a forum for people to share ideas. The Aspen Institute has campuses in Aspen, Colorado and on the Wye River on Maryland’s Eastern Shore. It also maintains offices in New York City and has an international network of partners. The Lauder family has been a longtime supporter of the Aspen Institute; Gary’s father, Leonard, has served on the board for nearly 30 years, Laura joined the board in 2014, and Laura and Gary have contributed nearly $1.5 million in philanthropic support. In 2012, Laura was seated in the 3,500-seat Music Tent at the Aspen Ideas Festival, listening to 4-Star General (Ret.) Stanley McChrystal, Former Commander of the U.S. Forces Afghanistan, speak about leadership. When asked what could transform American citizenship, General McChrystal responded that all young people should serve their country, doing either military or community service for a minimum of one year. A standing ovation ensued. Deeply inspired, Laura immediately went to work with Walter Isaacson, CEO of the Aspen Institute, to help create the Franklin Project: which seeks to improve citizenship by giving every young person in America the opportunity to do a fully paid, full-time year of service anywhere in the country. The Franklin Project is named after Benjamin Franklin, who believed that service by citizens was central to our democracy. Laura serves on the Franklin Project’s Leadership Council and its Executive Committee. In 1996, Laura and Gary helped the Aspen Institute launch the Socrates program with an invitation to 350 Silicon Valley young leaders to come to Aspen and engage in a Socratic seminar — Dilemmas of the Digital Age: The Impact of Technology on Democracy in America. Nearly 5,000 young professionals from across the globe have participated in typical seminars over the past 18 years. The program is a forum for emerging leaders, ages 28 to 45, to convene and explore contemporary issues through expert-moderated dialogue and seminars that are designed as values-based Socratic explorations to facilitate the exchange of ideas. Socrates programs include day-long salons in major U.S. cities and weekend-long seminars in Aspen and abroad. Laura and Gary have endowed the program by giving and helping to raise over $5 million in 2012 for operations and scholarships to ensure the long-term success of the Socrates program.